In the recently concluded legislative session, lawmakers failed to agree on how to conform Minnesota’s tax code to the new federal tax law passed late last year. The Governor and conservative leadership agreed on most of the mechanics of federal tax conformity, with some significant exceptions. Where they did not agree was on how to use the revenue generated by conformity. The “Tax Cuts and Jobs Act” (TCJA) passed by Congress last December provided massive permanent reductions in corporate taxes, more muted and temporary tax relief for most individual taxpayers, and tax increases for some taxpayers. The TCJA accomplished this through: (1) elimination of numerous tax deductions, exemptions, and subtractions, which had the effect of increasing the amount of income that could be taxed, and (2) reduction in corporate and individual tax rates. The effect of the rate reductions—especially the 40% reduction in the corporate tax rate—more than offset the increase in taxable income, thereby resulting in a net federal tax reduction for most taxpayers, at least in the short-term. State individual and corporate income tax rates are independent of federal rates. Thus, a change in federal rates has no effect on state rates. However, Minnesota and many other states rely on federal rules to determine individual and corporate taxable income. Therefore, state conformity to the recent federal changes—particularly, the repeal of deductions and exemptions—has the effect of increasing the amount of individual and corporate income that is subject to taxation, thereby increasing state tax revenue, all other things being equal. Governor Dayton and legislative leaders agreed that TCJA conformity would help to avoid greater state income tax complexity and increased tax filing headaches. They also agreed on most elements of conformity. For example, all agreed to switch from Federal Taxable Income to Federal Adjusted Gross Income as the starting point for calculation of state taxable income. In addition, they agreed to fully conform to business depreciation and expensing provisions; they also took similar approaches to personal and dependent exemptions and most itemized deductions that were repealed or altered in the TCJA. All sides agreed not to conform to the TCJA’s convoluted “qualified business income” deduction for pass-through entities. However, these differences were surpassed—not only in terms of dollars, but also in intensity—by the overarching question of what to do with the revenue generated by conformity. The legislature opted to use a substantial portion of the revenue generated by conformity to buy down corporate and individual income tax rates. The tax bill that the House and Senate sent to the Governor several days before the end of the session—which he vetoed—reduced individual and corporate income tax rates, although the rate reductions for corporations were several times larger than the reductions for individuals. In addition, the legislature repealed the corporate alternative minimum tax (AMT). In the long run, the corporate tax cuts resulting from corporate tax reductions, AMT repeal, and other measures in the vetoed tax bill would have exceeded corporate tax increases resulting from TCJA conformity. Given that Minnesota corporations are projected to receive massive federal tax breaks through the TCJA totaling $1.53 billion in 2019 alone, Governor Dayton opted to focus the revenue generated from TCJA conformity on relief for Minnesota families and individuals. Specifically, the Governor called for enhancements to Minnesota’s Working Family Credit and a new personal and dependent credit—measures that would focus tax relief primarily on lower- and middle-income households. 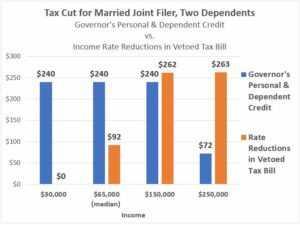 The new personal and dependent credit proposed by the Governor would have provided a larger tax break for low- and middle-income households, while the income tax rate reductions proposed by the legislature would have provided more relief for higher income households. During the final weekend of the session, the Governor offered a substantial compromise by agreeing to an individual income tax rate reduction‡ and repeal of the corporate AMT. During the waning hours of the session, the legislature responded by sending to the Governor a bill that combined reshuffled education funding for public schools with tax provisions that were nearly identical to those in the bill he vetoed earlier in the week. In the absence of any serious legislative movement on tax issues in response to the concessions he made, the Governor also vetoed this last-minute bill. So the 2018 session ended without a tax conformity bill. As a result, income tax preparation will be more complicated next year. However, the failure to enact a tax bill was not so much due to differences on federal tax conformity, but on what to do with the revenue generated by conformity. The Governor opted to focus the tax reductions primarily on lower- and middle-income households, while the vetoed legislative bill directed considerably more tax cuts to corporations and higher income households. *These provisions include the deemed repatriation of foreign source income and inclusion of certain foreign source income. Regarding the deemed repatriation of foreign source income, the Minnesota Department of Revenue (DOR) notes that “The TCJA requires a U.S. shareholder in a foreign corporation to recognize its share of the corporation’s accumulated deferred foreign income since 1986, whether or not the income is actually brought back to the U.S. The provision applies to cash and non-cash holdings…” Regarding the inclusion of certain foreign intangible income, DOR notes that under the TCJA “A domestic corporation is required to include in its gross income certain foreign derived intangible income (FDII) and global intangible low-taxed income (GILTI). The corporation may deduct a portion of the FDII or GILTI, with certain exceptions, lowering the effective tax rate.” DOR further notes that conforming to these provisions would increase Minnesota tax revenue. †In his tax proposal, the Governor recommended full conformity to these provisions, generating $256 million in FY 2018-19 and $398 million in FY 2020-21. The legislature (in both vetoed tax bills) recommended only partial conformity to the deemed repatriation of certain foreign source income, generating $56 million in FY 2018-19 and $68 million in FY 2020-21. The estimates cited here are based on projections from non-partisan House staff. ‡Legislative leaders proposed reducing the first tier individual income tax rate from 5.35% to 5.3% in tax years 2018 and 2019 and to 5.25% in tax years 2020 and beyond, while the second tier rate would be reduced from 7.05% to 6.95% in tax years 2018 and 2019 and 6.85% in 2020 and beyond. (In tax year 2019, the first tier rate applies to income below $37,851 for married joint filers, below $18,931 for married separate filers, below $31,881 for heads of households, and below $25,891 for single filers; the second tier rate applies to income from $37,851 to $150,380 for married joint filers, from $18,931 to $75,190 for married separate filers, from $31,881 to $128,090 for heads of households, and from $25,891 to $85,060 for single filers.) In his compromise offer to the legislature, the Governor proposed a larger first tier tax rate reduction—from 5.35% to 5.15% beginning immediately in tax year 2018—but no second tier rate reduction. The Governor also proposed reducing the income threshold at which the third tier tax rate (7.85%) applies, effectively reducing the tax reduction due to the first tier rate reduction for higher income households.